The Philharmonia Orchestra is widely recognized as the UK’s finest orchestra with an impressive recording legacy, this being their ninth release with Signum Records. This disc combines the Philharmonia’s renowned sound with the leadership of Maestro Davis, whose recording and performing career spans through all the great orchestras of the world. In the monumental Victorian era, with Britain ruling the waves and at the zenith of its economic, military, industrial and imperial power, artists, architects, poets and polymaths seemed to be ten-a-penny. The likes of Paxton, Alfred Waterhouse and George Gilbert Scott were erecting the grandest or most innovative structures, from sophisticated private residences, places of worship and on to Whitehall and the Crystal Palace. Alma-Tadema, Burne-Jones, Millais and co. visited classical poise, pre-Raphaelite beauty and artistic controversy on the Royal Academy, while Dickens, Wilde, Tennyson, Lewis Carroll and the Brownings measured conservatism with outright scandal, either on the stage or in published volumes. And then there were others, such as John Ruskin and William Morris whose brilliance shone over numerous arts and disciplines. While Great Britain was making the running in most of the arts and crafts, music seemed barely to be on the agenda—at least so far as home-grown talent was concerned. To the Germans, Britain was ‘Das Land ohne Musik’ (‘the country without music’) in the nineteenth century, and the island certainly comes up short when musical luminaries are the name of the game. This is hardly to say that the British Isles were not awash with great music—they certainly were, but little of it was indigenous. While Haydn, Mozart and Beethoven had rapidly become staples of the orchestral, chamber and instrumental classical canon, music for religious purposes had been somewhat stifled ever since the Puritan tirades against liturgical and theatrical music. The oratorios of Handel neatly side-stepped these issues by being neither liturgical in initiation nor purely theatrical in conception. Instead they were regarded as merely sacred and dramatic, which seemed to please everyone, even many a hard-line Nonconformist. This template was set before Victoria became monarch and Handelian oratorio, rather than opera, was setting the musical pulse of the nation. By the time Victoria and Albert were Queen and Prince Consort, Mendelssohn was already well known in Britain, having edited a few of Handel’s oratorios for publication in London and was busily breathing Bach’s St Matthew Passion back to life again in the public consciousness. His oratorio, Elijah, composed for the Birmingham Festival in 1846, and now with an English text, further endeared him to the British public and helped re-invigorate English composers into moving toward the European mainstream. As to orchestral music, the fascination with the Viennese School of Haydn, Mozart and Beethoven was gradually picking up on the later Romantic symphonists and increasingly Schubert, Schumann, Brahms and others were being played by groups such as the Crystal Palace Orchestra and, by the turn of the century, even Richard Strauss’s orchestral works were receiving fine notices in the United Kingdom. In England, the likes of William Sterndale Bennett, Edward German, Arthur Sullivan and Hubert Parry were not quite taking the symphonic bull by the horns with the gusto that their continental counterparts managed. 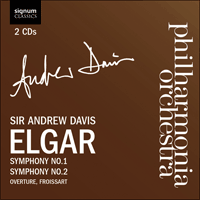 For the first great British symphonies of modern times which have stood the test of time and can lay claim to admission to the symphonic canon, we must turn to Edward Elgar, who, like Brahms, left symphonic composition until later in life. His first major work for orchestra was the concert overture Froissart, Op.19 which was premièred to excellent reviews in 1890 at the Three Choirs Festival in Elgar’s own heartland of Worcester. By turns rip-roaring, noble and romantic, the overture is a splendid evocation of the life and events described by the famous medieval chronicler Jean Froissart. Was Elgar really referring to himself? Who knows, but if so then he was certainly not far off the mark. Much encouraged by the success of the First Symphony, there wasn’t long to wait for another. After completing his Violin Concerto for Fritz Kreisler, again to tumultuous acclaim, the Symphony No 2 in E flat major, Op 62 was completed in double-quick time and again performed at the Queen’s Hall on 24 May 1911, now with the composer on the rostrum. Dedicated to the recently deceased King Edward VII, this time there was to be no jubilant celebration: the hall was some way from a sell-out and, according to one newspaper critic, the audience reacted to the work with ‘much favour, though with rather less enthusiasm than usual’. Another described the reaction thus: ‘the symphony was received with unhesitating and most cordial warmth’. Such damning with faint praise was a shock to Elgar who asked his friend and the orchestra’s leader, W.H. Reed, ‘What is the matter with them, Billy? They sit there like a lot of stuffed pigs’. Subsequent performances were very poorly attended and there was to be no repeat of the 90-odd performances the First Symphony received in its first year. Elgar was so put-out that not even his appointment to the Order of Merit in George V’s Coronation Honours list did much to lift his spirits. These days the Second Symphony is hailed at least as much as the First, and it is therefore difficult to pinpoint quite what the audience didn’t care for in the piece. It is written for similar orchestral forces and contains Elgar’s trademark wistfulness as well as plenty of gusto. It is certainly a more complex work and is rather less dramatic than the First Symphony, although both works are clearly identifiably by the same composer writing in the same idiom. It has been suggested that the symphony’s peaceful ending did not engender the rapturous behaviour from audiences which may have reacted more favourably to a rousing finale. The composer’s annotations for a programme note on the work give mention to the occasional extra-musical inspiration. While these are informative they in no way tell us what any particular passage or movement is actually about and Elgar was less than willing to encourage too much speculation—his gnomic utterances are often about as much help as the composer likely wanted them to be. For example, above the first movement, which he described as ‘tremendous in energy’ he wrote a quotation from Shelley on the score: ‘Rarely, rarely comest thou, / Spirit of Delight’. He later further explained, ‘To get near the mood of the symphony the whole of Shelley’s poem may be read, but the music does not illustrate the whole of the poem, neither does the poem wholly elucidate the music’. If this explains anything it directs the listener to the many questions and battles that rage at times in the symphony and point rather more towards Elgar’s own inner complexity than to any overt influence from the outer world. Even the funereal, elegiac Larghetto which might be considered as mourning the death of Edward VII was written, according to the composer, before the death of the King, and that the spirit of the work as a whole, ‘is intended to be of high & pure joy: there are retrospective passages of sadness but the whole of the sorrow is smoothed out & ennobled in the last movement, which ends in a calm & I hope & intend, elevated mood’. And yet, the composer Herbert Howells, in a 1938 broadcast, remembered Elgar describing the slow movement as indeed that of a funeral cortège for a king. One absolute certainty, straight from the creator’s pen is that the third movement was, ‘sketched on the piazza of S. Mark, Venice. I took down the rhythm of the opening bars from some itinerant musicians who seemed to take a great satisfaction in the broken accent of the first four bars’. There are numerous other utterances which either muddy the waters or possibly supply flickers of actual extra-musical influences. But as already noted, Elgar himself has already explained his symphonic credo: ‘I hold that the symphony without a programme is the highest development of art’. And with both of his symphonies, Elgar certainly reached the pinnacle of his own complex, exuberant, thoughtful and splendid art.